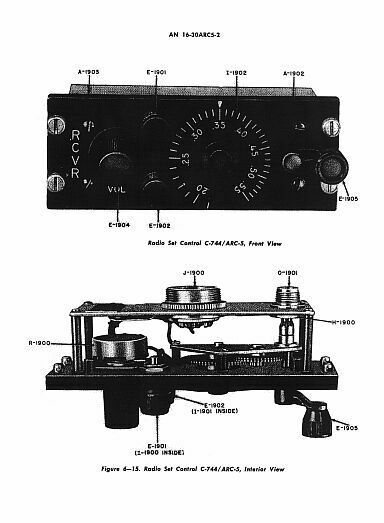 Model AN/ARC-5 Aircraft Radio Equipment is a complete multi-channel radio transmitting and receiving set providing communication and navigation facilities for aircraft. The LF-MF-HF components are designed to transmit and receive voice, tone-modulated, and continuous wave (cw) signals. Primary power (14 or 28 volts dc) is furnished by the aircraft’s electrical system. This power is distributed through a junction box or mounting rack, and is controlled by the off-on switches located on the control units. These switches, designated variously as ON-OFF, SENSITIVITY, or VOLUME, are either toggle- or rotary-type switches. 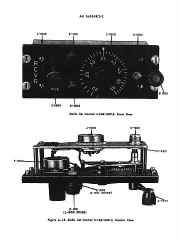 Individual dynamotors furnish high voltage to the radio receiver circuits. High voltage for the transmitter circuits is supplied by a dynamotor mounted on the modulator unit. For voice or cw operation, the radio receivers are tuned either locally or remotely through mechanical linkage connected to the control. 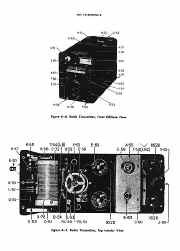 Lock-tuned operation of the radio receivers is available for voice reception only. The transmitters are pre-tuned with their frequency controlled by a master oscillator. The type of emission and the transmitter required are selected by individual switches mounted on the transmitter control unit. 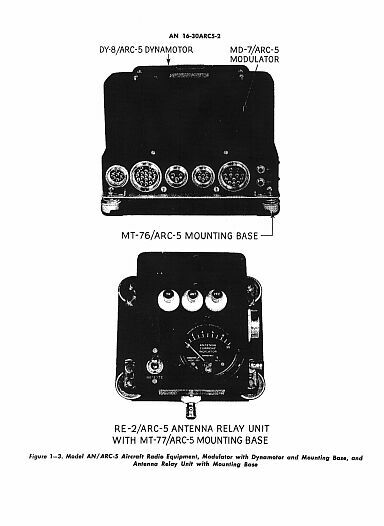 No antennas are supplied with the AN/ARC-5 but the equipment is designed for use with a single-wire antenna of the trailing or fixed type, a vertical mast antenna, or a loop antenna. 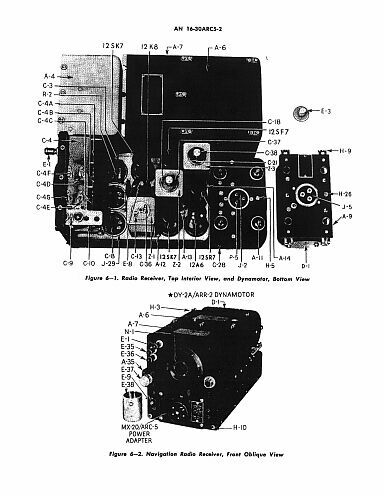 Removal and Disassembly of Radio Receivers. 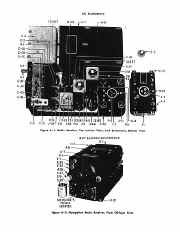 Control Units C-39/ARC.5 and C-48/ARC-5, Schematic Diagrams. 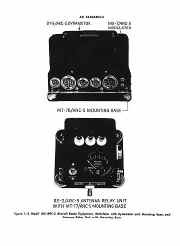 Junction Boxes J-28/ARC-5 and J-34/ARC.5, Schematic Diagrams. Manuals are Available Worldwide as a Download on CD or Paper Copy. Manual containing 331 pages including all Circuits with Component values. Printed Paper Copy or on CD are Plus Postage.